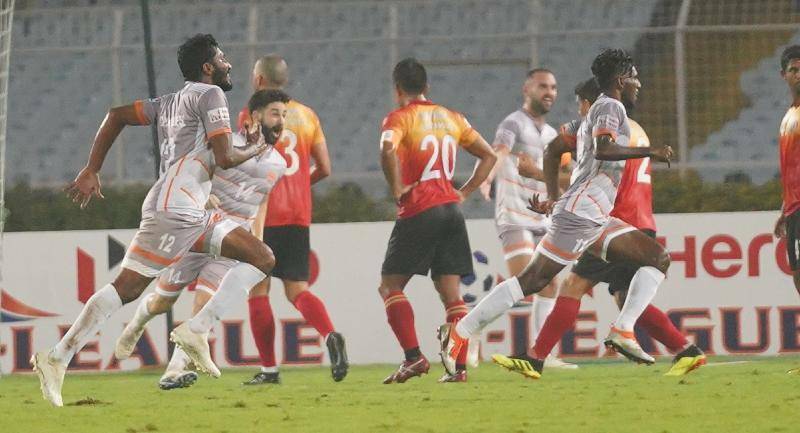 Chennai City FC consolidated their leadership position on top of the 12th Hero I-League standings with a 2-1 victory over Quess East Bengal (QEB) at Kolkata’s Yuba Bharati Krirangan (YBK) stadium on Tuesday. Spaniards Sandro and Nestor scored in either half for the visitors while Mexican Enrique Esqueda scored for the hosts in the second half. Chennai now has 10 points from four games with three victories to boast of, while East Bengal remains in the second position with six points and a game in hand. QEB made two changes to their starting line-up which began the last game against Shillong. Yomi Longwah was brought in, in place of Brandon in midfield while Samad Ali Mallick got his first start of the season replacing Lalramchullova. For the visitors, top scorer of the league Pedro Manzi, who had an injury scare in the last game was fit to start and Singaporean coach Akbar Nawas preferred an unchanged line-up. Although the home team began with a sense of purpose and Chennai looked as if they wanted to sit back deep in the initial stages of the first half, the visitors slowly but surely imposed themselves on the game with the help of splendid performances from their Spanish midfielders Nestor and Sandro. The former in particular was imperious throughout the game and fittingly scored the winner off a penalty to bag three points for his side. Chennai, in fact, had made their intentions clear from the beginning as they made the game’s first foray in the 4th minute itself when Nestor and Manzi combined to release Pravitto Raju inside the box but Rakshit Dagar in the QEB goal was up to the task. As the Chennai Spaniards, Nestor, Sandro and Manzi kept combining dangerously, coach Alejandro Garcia of QEB made an early change, bringing in Surabuddin Mallick in place of Laldanmawia Ralte in the 38th minute. However, Chennai were not to be denied a deserving lead. Lalrindika Ralte, who had been booked a while back, displayed irresponsible defending in inflicting another rough tackle on Sandro, in injury time of the first half. The resultant free-kick from just outside the box on the right was expertly slotted in by Sandro, eluding a diving Rakshit. East Bengal began the second half with urgency and were immediately rewarded. Jobby Justin put Surabuddin through on the right and his cross from inside the box beat the Chennai defence and goalkeeper Kabir, deflected off Johny Acosta and fell to Mexican striker Enrique Esqueda who slotted in calmly. Manzi’s injury recurring and he had to leave the field in the 56th minute had no effect on Nestor and Sandro, with the former in particular impressing again with deft touches and visionary passes while the hosts seemed to be running out of ideas in the attacking third. Meanwhile, Esqueda, who has scored thrice for East Bengal in the league so far, was booked and was replaced by Bidhyasagar Singh who had scored in the last game. However, nothing worked for the home team and it was Nestor’s class which eventually, paid off in the 87th minute. He found Raju in the clear with another great pass who in turn released Romario Jesuraj inside the box with a brilliant ball behind the East Bengal backline. Dagar had no option but to charge out and clip an evading Jesuraj’s heels in an attempt to clear but finally, he only ended up bringing him down. Referee Crystal John had no hesitation in pointing to the spot. Nestor converted calmly to finish what he had begun, to send the Chennai camp into delirium.